I prepared this side dish to compliment my grill recipe Chicken Pesto Burgers with Tomato Topping, but it would also be excellent with grilled steak or other grilled meats. It’s easy to prepare and comes together in less than 15 minutes, including the grilling time. It’s FANTASTICO! This will serve 4 as a side dish. 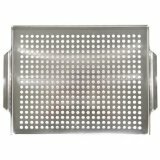 Preheat grill to medium. In a medium bowl, toss together the onion wedges, mushrooms, 1 tablespoon of the olive oil, and salt and pepper. Set aside and make the dressing. In a small bowl, whisk together the remaining 3 tablespoons olive oil, the vinegar, sugar; season with coarse salt and fresh black pepper to taste. Grill for about 10 minutes on a grilling rack or a vegetable basket, or until onions are slightly charred and mushrooms have cooked down a bit. Transfer to a serving bowl. Allow to cool to room temperature; then toss together with arugula and dressing. Top with crumbled goat cheese and sprinkle with pine nuts. Note: if you are unfamiliar with pine nuts, they usually can be found in the baking section of your grocery store, or with the display of Italian products next to pasta. To toast, place them in a small skillet over medium low heat for 2-3 minutes or until just golden. Roman ce was in the air, and we had a beautiful 1999 Veuve Clicquot Ponsardin champagne, given to us in November by dear friends of ours, that needed to be made good use of. My husband and I have had two failed attempts to go out for Valentine’s Day, due to sick kiddos and shortage of babysitters. 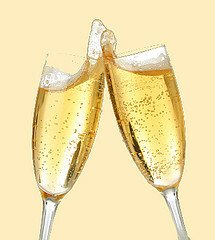 Alas, we resolved ourselves to celebrating at home, until such time as I am lucky enough to be served by someone else. Names never scare me. I knew that anything Emeril doctored up that I could barely pronounce had potential. Sure, it called for truffles – and a couple of years ago I would have made the trip to Whole Foods to spend the $25.00 for the jar. 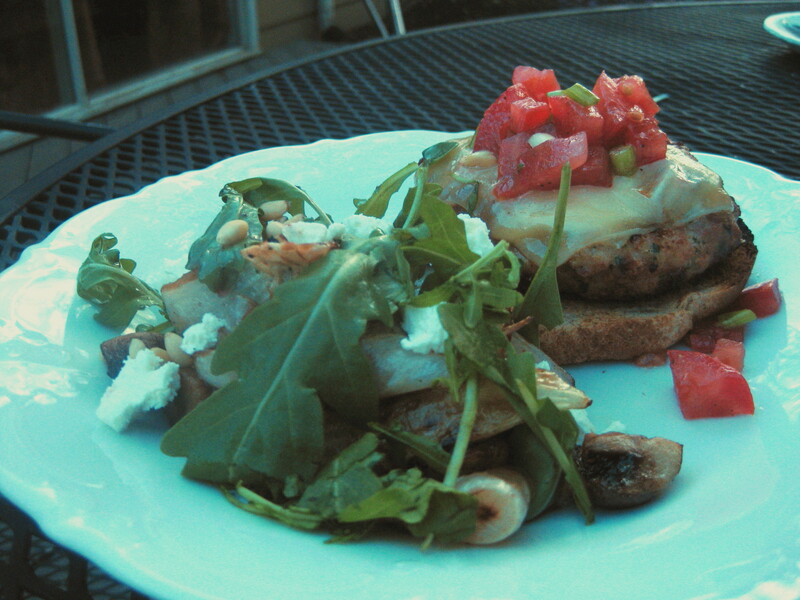 But I had some truffle oil in the cabinet which would do just fine for these tight-wad times of 2010. For those of you unfamiliar, a truffle is a delectable mushroom that is difficult to harvest, is grown in only a few places in the world, (mainly France) and therefore, costs about your monthly payment to your IRA. Not to be confused with a chocolate truffle – which is a chocolatiers’ delicious sweet knockoff of the real thing. This dish was superb. I changed quite a few things though, to make it easier, less expensive, and less time-consuming. 1. I used regular lemons instead of Meyer lemons, because that’s all my store had. 2. I didn’t use any truffles. Instead, I very thinly sliced a few fresh baby portobellos (cremini mushrooms) for the presentation. 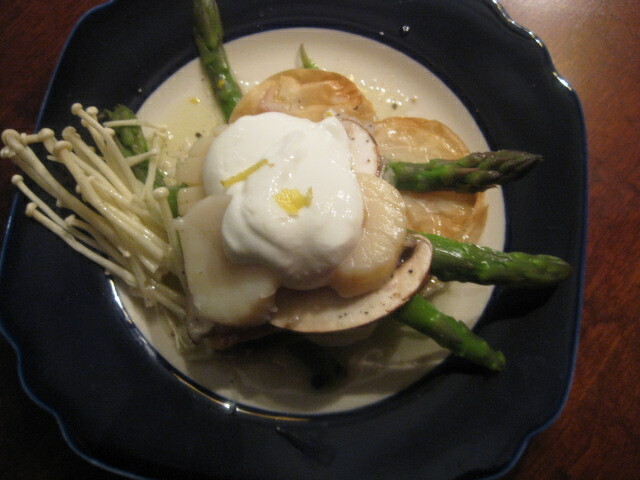 Then, I used my black truffle oil to make the dressing and drizzled a little extra over the whole thing at the end. 3. I didn’t buy puff pastry. Instead, I happened to have some leftover phyllo dough sheets in my refrigerator from a recipe I had done over New Year’s. Using a heart-shaped large cookie cutter, cut out a few stacks of heart-shaped dough, about 6 inches in diameter. Then I quickly separated the heart phyllo sheets into stacks of two or three sheets on the baking sheet as per Emeril’s directions. I brushed the tops of the hearts with a little butter melted in the microwave. Then I baked them only for about 5 minutes or so. It’s a good thing I checked the baking hearts then, because phyllo is much thinner than puff pastry and I hadn’t accounted for that. Lucky! They were just golden and crispy. 4. 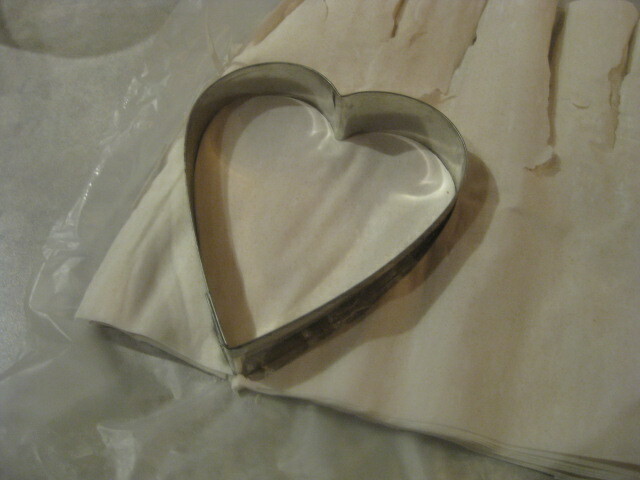 I used tin foil in place of parchment paper for baking the heart stacks. 5. I went on a wild goose chase to find Enoki mushrooms. Normally, I would have prepared ahead of time, and found them easily at Whole Foods or Trader Joe’s. But this was a whim, so after visits to three major grocery stores within a square mile in twenty minutes – I finally found them at the fourth , a stinky Vietnamese market. The shrooms were fresh. That’s all that mattered. And it was the one ingredient I wasn’t willing to sacrifice – because it made the presentation. 6. No creme fraiche available at my local stores. Instead, whole greek-style, plain yogurt was an equally delicious and a healthier substitute. 7. For the dressing, I used some of the fabulous champagne and white vinegar instead of store-bought champagne vinegar. about a 2:1 ratio. You could use a dry white wine with good results. We wanted a light dinner, but the scallop recipe just seemed a little too light – and while I was inspired by the dish’s sophistication, I decided to do a soup for a first course so we wouldn’t be hungry afterward -as sometimes happens after a light and sophisticated meal. 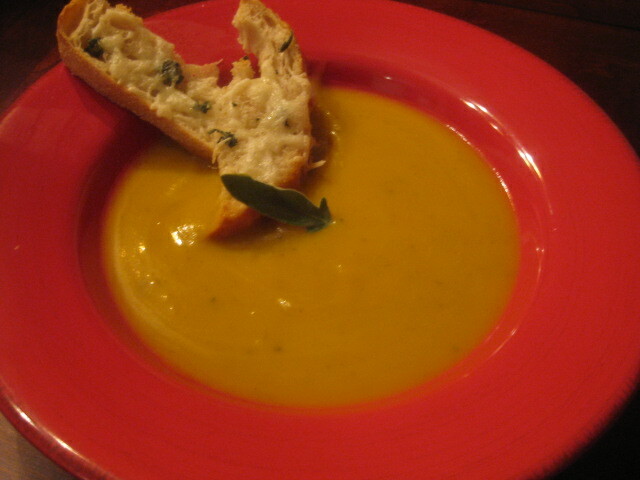 In keeping with new commitment to health during Lent, I opted for a butternut squash soup from Giada DeLaurentis; she rarely lets me down, and I thought the texture would be creamy enough to satisfy my fat craving. It originally was writte n to serve six as a first course, so I figured I could cut it in half and maybe still have a cup left for the kids to try the next day. 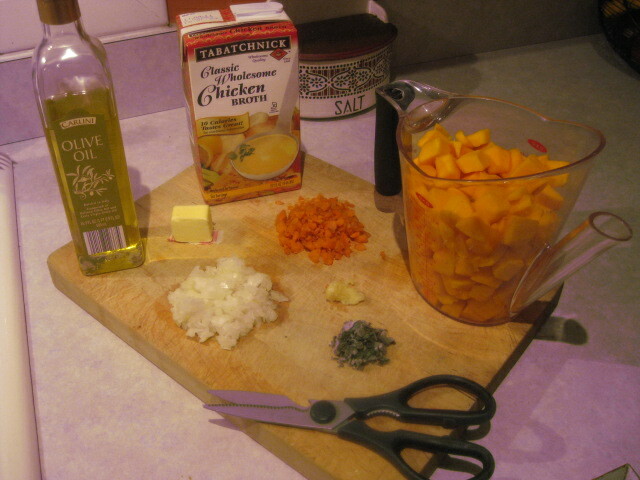 Besides, I was going the lazy way at the store – didn’t want an extra 15 minutes prep time cutting up squash – and more than two bags of pre-cut butternut squash was just too expensive. When I got to the store, the only pre-cut squash was with a cinnamon sauce – but I could see from the bag, that it was just a chunk of brown sugar that would melt upon heating. So I just opened the bags and discarded the chunks of cinnamon sugar and voila – I had pre-cut, unseasoned butternut squash for my recipe. Otherwise, I followed the recipe to the letter – which is unusual for me, and it was PERFECT. I’m not kidding you. My husband said it was so fine, smooth, and velvety, and assumed it took a long time to make (it didn’t). It was healthy and creamy, without an ounce of cream. Unbelievable. I was surprised by the ease with which this came together. And, it could easily be a light supper, all on its own – perhaps even vegetarian, if vegetable stock were used instead of chicken stock. Whenever I do a fancy dinner at home for the two of us, I like to do a very light appetizer or an amuse-bouche. We are lucky enough to have a new, authentic French (Basque-style) deli nearby, so we happened to ha ve a wonderful country-style pate in the fridge. 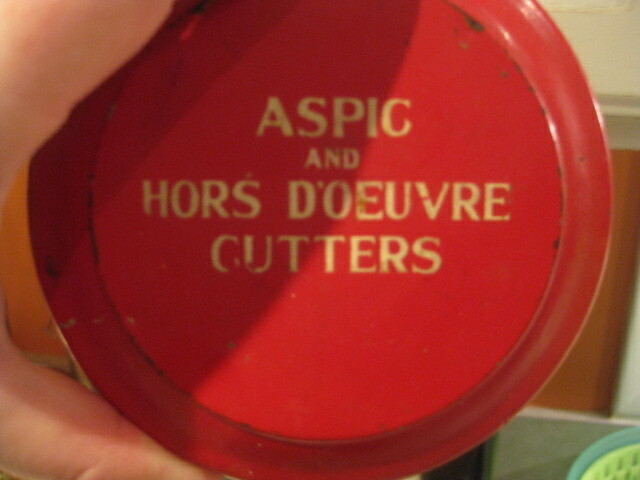 Then remembering that my mom had given me some small, vintage aspic cutters a long time ago, I was inspired to again incorporate the Valentine’s day theme. 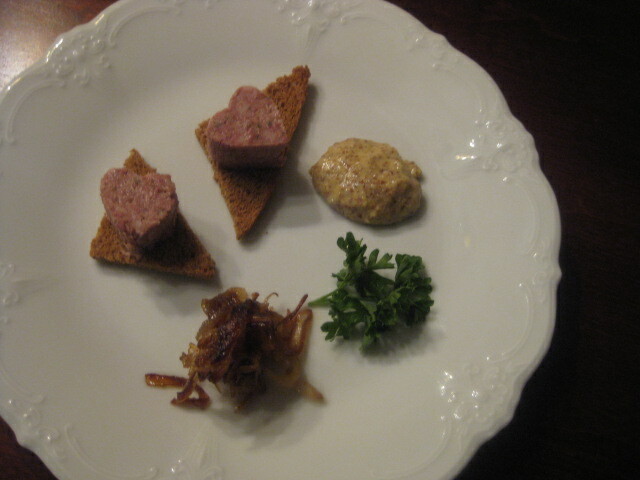 I carmelized a few onions and added a little brown sugar to them to garnish the appetizer, and served the pate in the traditional way with some grainy Dijon mustard and toast points. To round out the meal, my husband had also bought – in honor of our late celebration – some fabulous chocolate mousse and fresh pear pastries from the French guy at the deli. It’s a good thing, because while I love to cook, I’m not one for making desserts. When it was all said and done, this was a fabulous Valentine’s day celebration. I wish I had taken photos of the beautiful dessert that DH had brought home for us, but I had been preparing our dinner for two hours, blogging simultaneously, and it was 9:30 pm by the time we got to dessert… so you’ll just have to imagine how pretty it was. The first thing I think of whenever I see this recipe is “how did they manage to put so many vowels in those words?”, and I usually have to look at it to type it or I’ll spell it wrong. This recipe is not for the faint of heart – there is an ample amount of animal fat, oil, and butter. DH and I are intending to begin a new regime this week, so we figured we may as well get the last culinary “hurrah” before we have to lay off the fat stuff for a while. I’ll preface today’s post by saying that the majority of recipes I intend to blog about won’t be nearly as rich and complicated, primarily because I just won’t have time for long posts like this on a regular basis – and, because most of us don’t have time to make recipes like this frequently – I suspect I’d lose you. 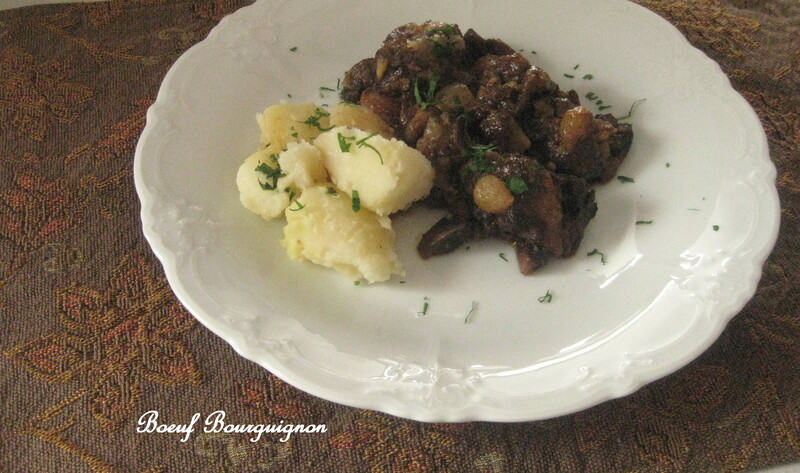 But since the inspiration for me began with the story of the blogger taking a culinary journey with Julia – it seems only appropriate to begin our journey with the famed French recipe for Beef Stewed in Wine. It’s not difficult. It’s just got a few steps, and takes a little time. Save it for the weekend, when you can be doing laundry or playing with kids between steps. For the recipe, I’m paraphrasing here from Julia Child’s version in the “French Chef Cookbook” (her version is a little wordy). I simplified it a bit but tried not to lose any of the integrity of the real deal. • 6 oz. of lean salt pork, pork belly, or fresh (not smoked) bacon, cut into 1×1/4 inch pieces. If you must, you can substitute thick-sliced smoked bacon, cut up. Once all you have your ingredients ready in one spot, preheat your oven to 325F. Over medium-high heat, fry the lardons (bacon pieces) in a large skillet (I like non-stick for this) until browned. Remove the pieces with a slotted spoon, and set aside. Then add about a tablespoon of vegetable oil to the skillet so you’ve got a good covering of fats on the bottom. In two batches, brown the meat on all sides a couple of minutes. Then place each batch of browned meat into an ovenproof casserole dish, ideally one that has a cover (or you can use foil). When the meat is browned and transferred to your casserole, drain the excess fat from the skillet but don’t wipe it – leave the brown bits at the bottom. Put the pan back on the heat and pour in the wine, scraping up any bits and goodness at the bottom. Pour the wine from the skillet into the casserole, and add enough beef stock to almost cover the meat. Then add your tomato paste, mashed garlic, thyme, bay leaf. It didn’t say exactly whether or not to mix it in, so I just gently loosened up the paste in the broth and moved it and the thyme around the liquid a bit. Save the skillet for the next step. Bring the stew to a simmer on the stovetop. Then cover the casserole, and put it in the preheated oven for at least 2-1/2 hours. I did mine for 3-1/4, but I like it falling apart. While the stew is cooking, sauté mushrooms in a tablespoon each of butter and vegetable oil. Season with salt, then transfer to a small bowl and set aside. In the same skillet, add one more tablespoon of butter, the peeled onions, and enough water to cover the bottom of the pan. Bring to a simmer, cover the skillet, and cook the onions until nice and soft. Remove from heat and set aside. About 15 minutes before you are ready to serve, add the prepared onions and mushrooms to the casserole. Gently mix them into the cooking juices and return the casserole to the oven until they are just heated through, about 5-10 minutes. Then, pour the cooking liquid from the casserole into a gravy separator, if you have one. Add enough stock to make 2-1/4 full cups of liquid. 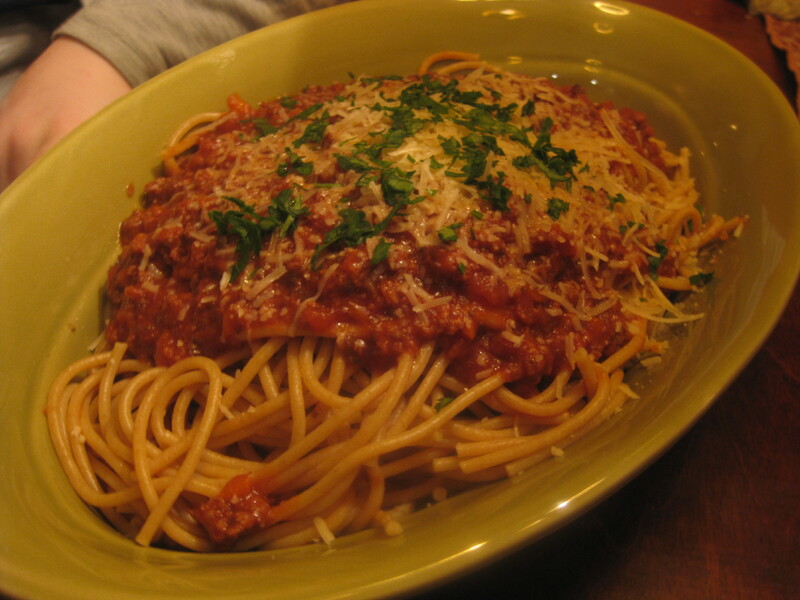 Spoon off excess fat or let it stay in the separator when you add the rest to the sauce. In a small saucepan over medium heat, melt 3 tablespoons of butter. Add 3 tablespoons of flour, whisk and cook until blended about 1-2 minutes. Then, slowly whisking, gradually add the de-fatted cooking liquid, a few tablespoons at a time, until all is incorporated. Bring to just a boil until beginning to thicken, lower heat and simmer for 5 minutes. Season well with coarse salt and fresh ground pepper, and taste. Since you haven’t added any salt and pepper to the stew yet, the sauce will serve as the seasoning. When the sauce is done, make sure the rest of the fat has been drained out of the casserole, and then add the sauce to the cooked stew. Mix around gently and heat on the stove top for a minute or two. Taste again and adjust seasonings. Keep warm until serving. IT’S DONE! I’ve always exposed my kids to everything I cook, so they can tolerate more flavor than most kids that are accustomed to a weekly mac and cheese diet. 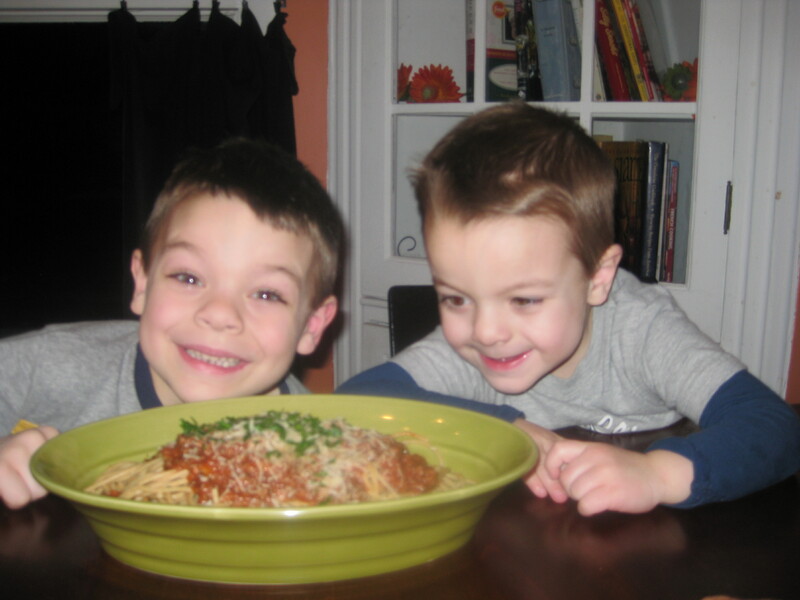 They still didn’t gobble it up – so this will not get a ‘kid-friendly’ recipe tag. My husband and I, however, had no problem. I served it with parsley buttered boiled potatoes, and a green salad and crusty artisan bread – traditional as told to me by both the book and my husband. First, you should know that DH and I had ordered part of a cow this year for our supply of red meat, (the most delicious I’ve ever tasted!) so I used a chuck roast – trimmed the meat off the bone as close as I could, and then cut it into large stew chunks. I kept used the smaller bone pieces to retain the flavor from them and discarded the longest one because it didn’t fit nicely in the pan. If you don’t know this, the marrow from the bone of the cow is succulent (some gourmet restaurants even serve it as a dish). So don’t throw the bones away until after you cooked the stew with it! 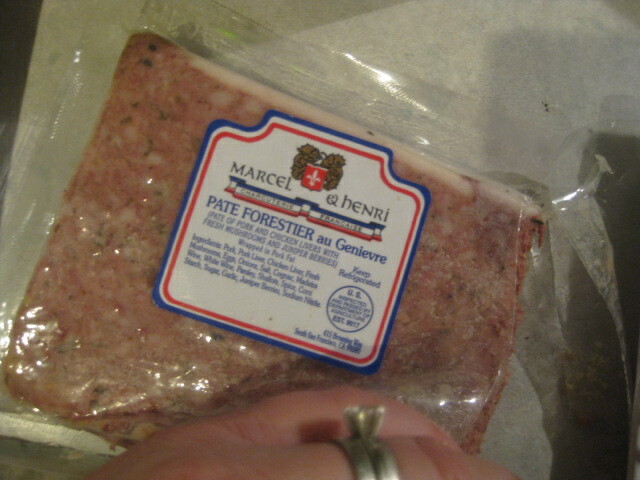 I thought I was lucky to find pork bellies in my grocery store – which is the original ingredient used in place of bacon. But, it turned into a lot of wasted time. I found it to be difficult to cut up – ended up using kitchen shears, and mid-way through frying them, I realized they needed to be smaller in order to brown, so I frantically was cutting them smaller while they were in the pan. I would stick to ready-made fresh bacon, if you can find it, that isn’t smoked – or use regular bacon and simmer it for a few minutes immersed in water to get the smoky flavor out (as recommended by Julia). Then dry it with a few paper towels, and fry it up as you would. If you are just not up for the extra step – I’ve used smoked before in other recipes for this with fine results – it’s just not as traditional, and truly, the flavor is not as completely delicious. I had already begun this recipe before I realized the only wine left in the house was a simple Columbia Crest drinking merlot, not the finer pinot noir (or burgundy) that it calls for. But, unless I wanted dinner to be served at 9pm – I had to proceed, and at least it was a younger red. So in went the merlot and after the casserole was already in the oven I had DH run out and get a proper wine to at least drink with the dinner. Another thing I changed is to reduce the wine to 2 cups, and replace it with another cup of stock, which by the way, I only had chicken stock in the house too. This toned down the wine flavor just enough so that the kids would taste it without making a face – because 3 cups really is a lot of wine flavor, even for me, and I have a very high threshold for wine consumption 😉 . The chicken stock was perfect – a bit lighter and allowed the flavor of the true beef to come out instead of being masked with the heavy taste of beef stock. Perhaps were I not using top quality beef from a butcher, it would have needed the extra beef flavor.